frail, young woman lies on the examining table as it rocks with each uncontrollable convulsion that manifests deep inside her. Her pupils disappear under her eyelids as another internal rumble makes its way down to the rickety table legs. Her worried family stands a couple feet away with sadness etched in their faces. There is an infant, who was delivered at home two weeks before, fast asleep in their arms. The rattle of the table legs heighten the tension among the doctors and increase the tears from her family. A herd of doctors huddle around the woman and attempt to end the violent spasms. An anesthesiologist takes a bottle labeled Propofol and fills a syringe. Once it is filled, she injects the patients’ arm with a large needle and sedates the woman to prevent further brain damage. Seconds after the clear liquid surges through her veins, the raging thrashes cease, and the woman lies still on the table. Doctors from Refuge International, a volunteer medical group, take advantage of her calmed state. They tilt her head back and insert a plastic tube about 12 inches in length down her windpipe to secure her breathing. A steady and hushed beep…beep.. of the monitor plays in the background while all eyes in the room remain fixated on the woman. Eclampsia is a high blood pressure ailment only seen in pregnant women or recent mothers. The woman exhibited advanced eclampsia, a disease easily prevented in developed countries and nearly unheard of in the United States. But in third world countries like Guatemala, symptoms of pre-eclampsia and other susceptibilities of pregnancy often fall through the seams of prenatal care and education. Refuge International, provides little to no cost healthcare for the people of Guatemala. The doctors who dedicate their time to impoverished areas of the country battle, among other health issues, the difficulties and consequences of pregnancy. Absence of prenatal health care, malnutrition and the repercussions of both are problems that they treat regularly. Rural areas of Guatemala, like San Raymundo, where this woman was from, suffer more so than urban areas like Guatemala City. Dr. Archana Mane, an anesthesiologist at Albany Medical Center in New York, witnessed this particular case during her stay with Refuge. She said this is something that is never seen in the U.S. because of the intensive obstetrical care that’s provided to prevent such things. High blood pressure can be expected during any pregnancy, but it always highly monitored so that it doesn’t advance to eclampsia, liver and heart failure. In the U.S. and other developed countries women see an obstetrician the second they find out they’re pregnant. 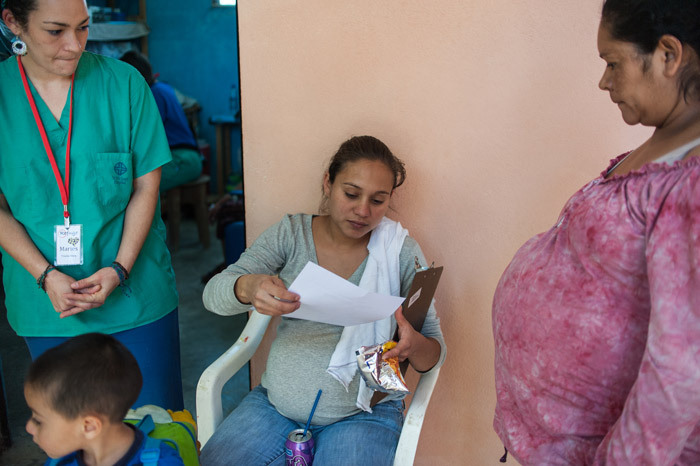 They receive prenatal vitamins, information and a list of appointments spread out for the foreseeable nine months. There is extensive and regular monitoring throughout the pregnancy whether the expectant mother faces serious illness or not. “Your pressure never gets so high (in the U.S.) that you start seizing… But in underdeveloped countries, it’s not detected and they have complications,” Mane said. Antonieta Rompix, 32, is woman who received no medical care during those nine months. 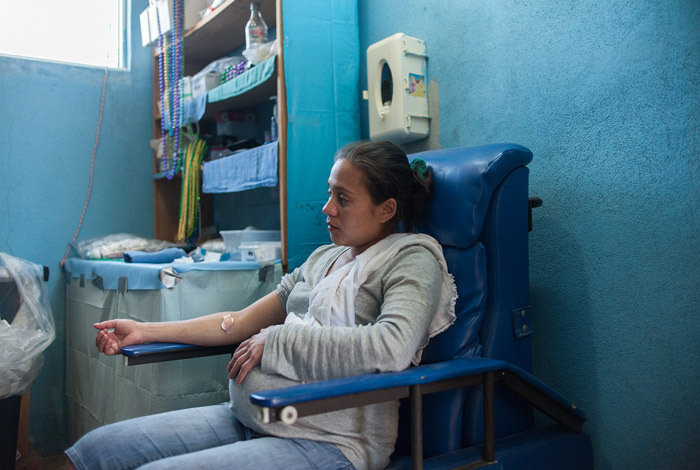 She lives in San Raymundo and was in danger of needing an abortion due to high blood pressure and other complications when she was pregnant with her six-month-old son, Cesar Emilio Canel. He was born three weeks premature and has suffered from pneumonia for five months. Luckily, she did not fall victim to high blood pressure as severely as the nameless mother. Guatemala is one of the most poverty stricken countries in Latin America, just above Haiti. Mane said Guatemala is victim to some of the highest maternal and infant mortality. In the U.S. it is at 9.5 per 100, 000 versus 250 or more per 100,000 in Guatemala and other underprivileged countries, she said. Seldom is prenatal and obstetrical care practiced in countries like Guatemala. Midwifery is the traditional method of maternal care, especially among the indigenous population who live in rural areas. A consequence of this is that women don’t receive the proper nutrition therefore affecting their pregnancy. This is the case with the majority of patients that Refuge International treats. Nancy Neuman, team administrator of the medical group, said malnutrition is the most common complication they have seen walk through their clinic doors in San Raymundo. This phenomenon prompted Refuge to enact a prenatal vitamin program. Most women who are expecting and nursing a newborn simultaneously split their already deficient nutrient intake by three. Some women simply don’t have the money for or knowledge of prenatal care. They face distance and transportation constraints, as many of them live deep in rural villages. The cost of services also presents an obstacle to pregnant women. “You can’t teach somebody about nutrition who doesn’t have enough money to buy vitamins,” Dr. Carol Kiesling said, an obstetrician-gynecologist in the U.S., who has been on two trips with Refuge International in San Raymundo. “We probably give out enough vitamins a year to cover the needs of over a thousand women,” Neuman said. The lack of prenatal monitoring and nutrition can result in more health problems than advanced stages of eclampsia. Kiesling has seen women living with consequences of home and hospital deliveries. She recalled a patient that came and specifically asked for a cesarean section because of a previous traumatic experience with a home delivery. The patient delivered a stillborn and refused to be treated by a midwife. Kiesling said there is a high mortality rate in Guatemala for newborns and mothers alike. Many economical and cultural factors determine what type of care women choose to use during pregnancy. Whether they have access to biomedical health services does not always determine what they use. What is viewed as an ill-advised and potentially dangerous practice in the U.S., is the norm in Guatemala. Some women prefer to use comadronas, because it’s the more traditional avenue that adheres to their religious or cultural beliefs. The women who do receive health services during pregnancy do not always receive optimal care. “There are practices that don’t coincide with what is considered safe in the U.S.,” Kiesling said. Pushing before the cervix is safely dilated, applying pressure on top of the uterus during labor and vertical c-section incisions, all of which cause harm, are things that are exercised in third-world hospitals, she said. Refuge regularly treats women with abnormal or excessive bleeding, enlarged uteri and fibroids, which can all be results of lack of prenatal care. “There is a large need for women to have surgery,” Kiesling said. Hysterectomies are a common procedure when Refuge International visits San Raymundo. Most women come to the clinic already knowing that they need a hysterectomy. They arrive on an empty stomach and wait for hours, hoping for a same day surgery, she said. Neuman said they perform an average of 12 hysterectomies each week they are there, and always tell them to come back for a check-up when Refuge International returns. There are countless cracks and seams in the almost nonexistent walls and floors of maternal health care in places like San Raymundo. Refuge International helps to patch them up. Fifty million women living in developing countries experience some form of pregnancy-related complication each year. These women may or may not receive treatment. Guatemala seems to make up a significant percentage of those numbers given their poverty level and number of women who have home births. The women carry more on their backs than just babies in their slings; they withstand the burden of their well being to survive pregnancy with no medical aid. Once the woman’s breathing stabilized the doctors retreat. This was the extent of aid that they could provide. She is carried outside and is lifted onto the ambulance stretcher, still sedated, with a manual air bag attached to her mouth. Two paramedics tilt and slide her into the back of the car and shut the red doors. She will be taken two hours away to a hospital in Guatemala City for advanced treatment.